Fox Racing casual wear is becoming one of the leading brand names in motocross apparel today. Not only does the Fox Racing casual apparel look good, but it's made with high quality fabric and sewn giving it a durable and comfortable fit. Fox Racing designs a wide range of apparel for ladies, men and youth from; Sweatshirts, T-Shirts and Jeans, to Belts, Socks, Shoes, and Hats. Each of Fox Racing apparel items has its own unique screen printed graphics, look, style and design. We all know Fox Racing is widely known for their motocross gear and protection on the track but now they are known for their great casual look you can be seen in off the track as well. 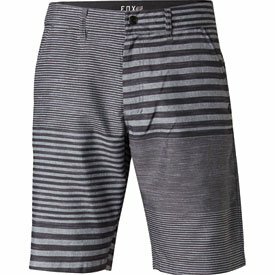 Fox Hydro Series Shorts are designed to look like a walk short, but function like a board short. Constructed using technical performance and quick dry board short fabrics, the Hydro Series Shorts are the perfect shorts to wear from the beach to the streets. Solid dyed with over sublimated graphic. Front zipper with Fox logo snap at waistband.